AutoTweet NG - Unlimited auto publish from Joomla! AutoTweet NG PRO is the most powerful Joomla! extension to automate and curate content publishing from Joomla! to Facebook, Twitter, LinkedIn and more. 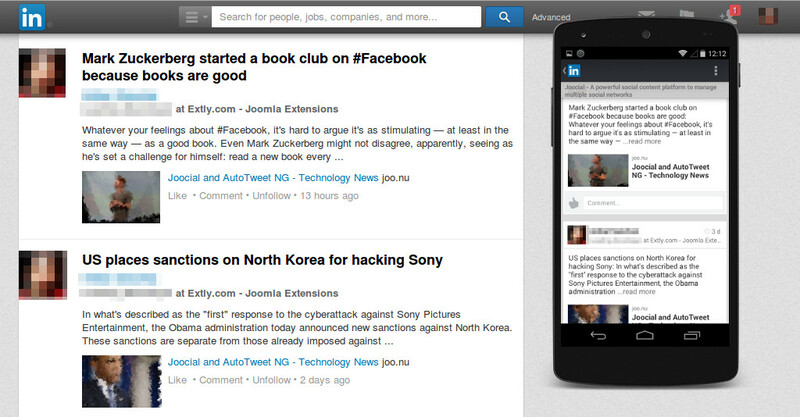 Simply, AutoTweet posts your content from all well-known extensions to social networks. Looking for Auto Tweet NG Free? Restricted to 2 Social Channels and community forum support. Beyond the simplest case of auto-posting, where an author creates a Joomla! article and a post is published to a social network ( Facebook ( Requires App Review), LinkedIn, Twitter, etc). 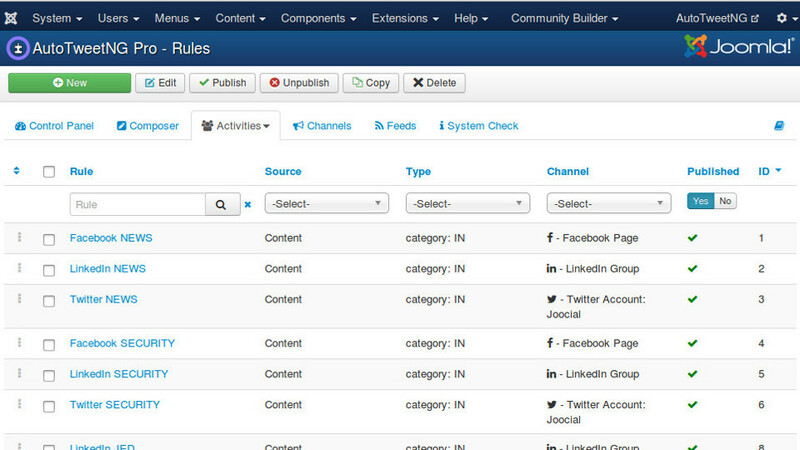 AutoTweet PRO allows you to implement a social media strategy to integrate over 60+ Joomla! application extensions to an unlimited number of channels. AutoTweet is mainly oriented for unassisted auto-posting. Just keep using Joomla! as usual, creating articles or other content items. 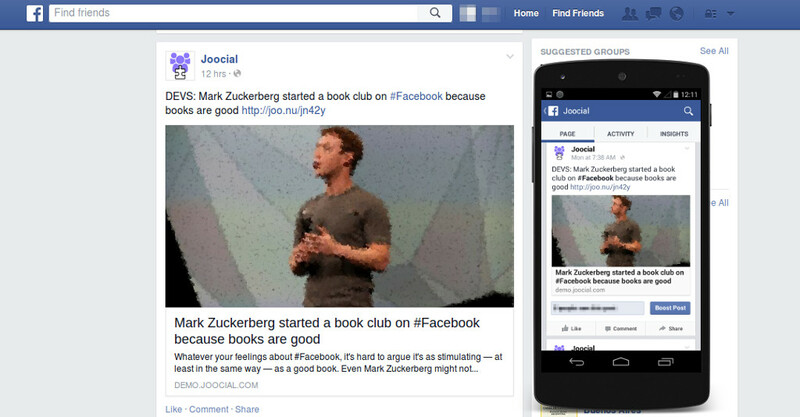 Finally, Joocial + Composer App is the ultimate social media solution for Joomla!. It brings all features for auto-posting, social publishing (agendas, evergreens, scheduling, etc) and an innovative mobile application, the Composer App. Composer App integrates posts with all mobile social channels, like Facebook ( Requires App Review), Twitter, Google+, Instagram, Pinterest, WhatsApp (or any other application ). An operative dashboard to have a quick view of your social media actions. A supreme editor to create your messages. Composer allows you to take advantage of the designed strategy for automated and manual social posts. Therefore, all social posts follow the same planning to reach a higher degree of consistency. All activities can be managed and monitored. Requests and posts can easily be canceled, repeated or rescheduled. To implement a supreme social plan, rules provide a method to organize content, customize and distribute it along heterogeneous social channels. For instance, AutoTweet can apply rules by category, author, language, words, or regular expressions. Social channels define the main area of integration from your content to social networks. In this optimized area, the required authorizations are simply granted according to your account profile. AutoTweet plug-in implements the largest Joomla! ecosystem hub for social networking. The social hub is outside the range of other sharing solutions, including all plug-ins in a handy package. To enrich your auto-posting from native content, RSS Feeds grabber provides a boost to social timelines adding complementary posts to the main topics. Additionally, if you look for more, you can take advantage of more social networks (namely JomSocial, Scoop.it or Tumblr), post scheduling, repeats, evergreen posts and a virtual manager, you can easily upgrade to Joocial. An immense number of 62 user reviews roars for AutoTweetNG PRO as the most popular extension for Social Share Auto-Posting for Joomla!. In addition, the total number of user reviews for the whole family (Auto Tweet Free, Auto Tweet NG Pro and Joocial) is 149! Functionality: Very good. Ease of use: It's ok but on the first time you must understand a few things. Support: Excellent. Really. They help in a few hours. Documentation: It's clean and useful. Sometimes you must predict what the author wanted to write. Value for money: It's fair. Functionality: This product can automatically tweet and post for you. Also use it to capture content from RSS feed and reformat it into articles. Ease of use: Pretty straightforward, but involves lots of settings. So take your time and have patience. Support: Did not need support. Documentation: The tutorials are very helpful. Value for money: Very good. (*) New Plugin Best-Effort Support: We love to integrate new extensions as the way to improve our social hub beyond its limits. If we don't have a plug-in, we add it in product roadmap to release ASAP (in practice 1-2 weeks). Our track record is in the change log. 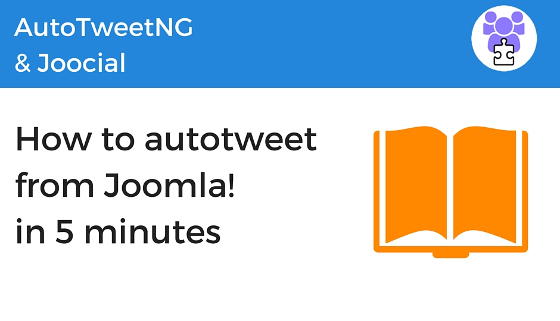 AutoTweet can auto-publish content from the following Joomla! extensions to social networks. Joocial-enabled plug-ins support extended features: integrated Post Management, Post Editor Button and Toolbar, evergreen posts and front-end/back-end user interfaces. If your component is not included in the list, you can load the content as an article. You can also recommend us to check and develop the plug-in. AutoTweet has a powerful editor to create and edit social posts. In this way, you can create new messages to follow the same content defined strategy than the rest of the posts. 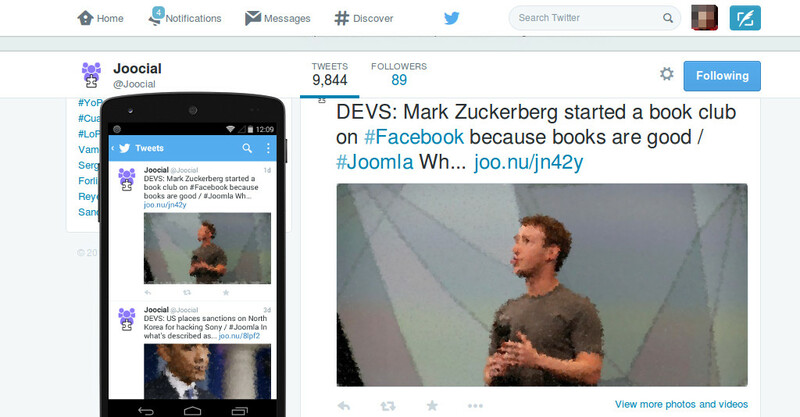 AutoTweet allows any number of channels to distribute generated content into multiple social networks. Combined with multiple channels, the rule engine allows you to route and customize messages in the road to be distributed. 5 stars - " Great component excellent team"	by faitas The component does what it says, though the most important is that the team behind this, is extremely helpful and offer great support and value to the customers.